Holy Week Timeline – whatever things are true,… if there is any virtue and if there is anything praiseworthy –meditate on these things. Today my One Walk with Jesus continues through Holy Week with reflecting on His actions on Monday, the day after His triumphant entry. ‘It’s so hard to be good!’ And so we have to practice. It is hard to become a concert pianist. It is hard to become an expert surgeon. It is hard to become an outstanding ballerina. We have to practice and practice and practice. If this is true of the worldly arts, it is more true of the art of spiritual fidelity. When you look the right way–toward what is true, noble, lovely–you are encouraged and strengthened. Quotation Mark from Jesus Today, page 20. Finally brethren, whatever things are true, whatever things are noble, whatever things are just, whatever things are pure, whatever things are lovely, whatever things are of good report, if there is any virtue and if there is anything praiseworthy–meditate on these things. Painting by Carl Bloch: "Casting Out the Money Changers". The following morning, Jesus returned with his disciples to Jerusalem. Along the way, he cursed a fig tree because it had failed to bear fruit. Some scholars believe this cursing of the fig tree represented God’s judgment on the spiritually dead religious leaders of Israel. Others believe the symbolism extended to all believers, demonstrating that genuine faith is more than just outward religiosity; true, living faith must bear spiritual fruit in a person’s life. 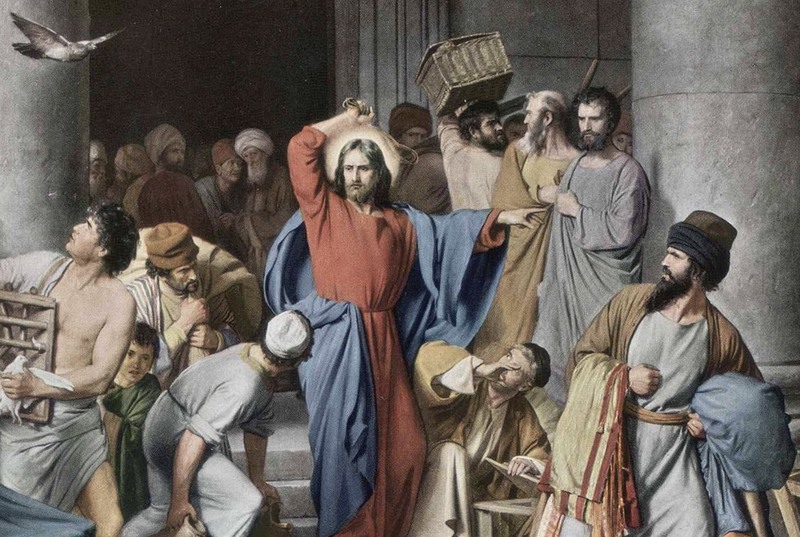 When Jesus arrived at the Temple, he found the courts full of corrupt money changers. He began overturning their tables and clearing the Temple, saying, "The Scriptures declare, ‘My Temple will be a house of prayer,’ but you have turned it into a den of thieves" (Luke 19:46). Dear Lord God, Abba Father, Jesus my Savior, thank You for Your love, forgiveness and blessings. Help me walk with Jesus through His Passion, meditating on each event and word. Give me passion for His truth and understanding and wisdom to apply it in my walk. Let this post touch someone in need and awaken them to Your love and truths. In Jesus name I pray. Glory be to the Father and to the Son and to the Holy Ghost; as it was in the beginning is now and ever shall be, world without end. Amen. This entry was posted on April 15, 2019 at 6:32 am and is filed under One Walk. You can follow any responses to this entry through the RSS 2.0 feed. You can leave a response, or trackback from your own site.